Exfoliation will help keep your pores open and free of blackheads and acne. It will also show, faster, your new skin, made younger thanks to BulkActives's skin actives. There are three ways of exfoliating your skin: sandpaper or similar (crystals used in microexfoliation), chemical peels and enzymatic peels. Chemical peels are acid solutions that will break down the proteins in the most external layers of the skin IF used with caution (used without caution they will burn the skin). Enzymes loosen upper epidermis layers, cleanse the pores and improve complexion texture, elasticity and tone. Enzyme exfoliation helps to maintain proper pH balance because it doesn't involve acids. It is suitable for everyone and has no side effects. Enzyme peels are advised for treating dryness and overcoming allergy manifestations. 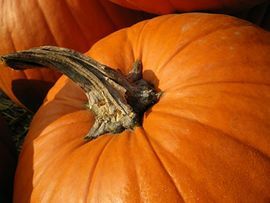 Pumpkin proteases (proteolytic enzymes) are known to hydrolyze the proteins, simultaneously peeling dead epithelium cells and blemishes and supplying skin with vitamins and nutrients. Pumpkin exfoliation makes skin look clean and silky smooth. Do a patch test: apply peel on the inside of your arm to check whether it suits your skin and doesn't provoke allergic reaction. Skip areas around the eyes and lips. Wash pumpkin peel remains away and dry skin gently. Repeat procedure twice a week if there is no sign of irritation. Follow pumpkin enzyme peel with your nutritive cream to provide epidermis with all nutrients needed for renewed cells. Pumpkin enzyme peels are frequently accompanied with a mixture of fats and vitamins that moisturize and nourish complexion after exfoliation procedure and counteract free radicals preventing premature aging.